You've finally found your perfect shade of nail polish. So would it be too matchy-matchy to wear it on your fingers and toes? Wearing the same shade of polish on your fingers and toes helps you look more finished. You can use two different colors, but make sure they coordinate. Having red fingernails and blue toenails isn't the way to go. Calluses and corns are hardened skin that can crack and hurt if they get too thick. During a pedicure, don't let the salon technician use a razor on your feet. 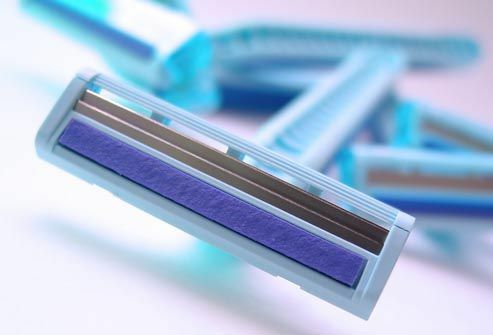 Razors raise the risk of infection. At home, soak your feet in warm water for at least five minutes. Then use a foot file, pumice stone, or exfoliating scrub to remove calluses. Don't go barefoot, either -- it can cause calluses. Cuticles keep out germs, so treat them well! Tell the nail technician not to push back or cut your cuticles during a pedicure. This raises your risk for infection. In between visits, never tear your cuticles. You can soften ragged cuticles by rubbing in moisturizer. If you notice that your cuticles are red or irritated, see your doctor. 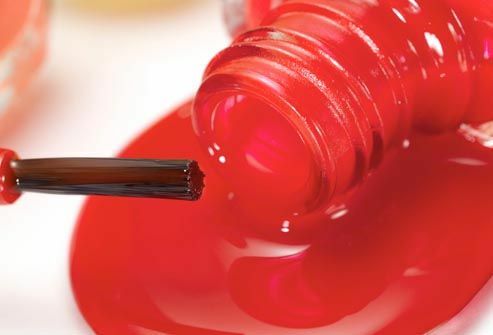 Dark, dramatic shades such as red and purple can stain nails yellow if you leave them on for more than two weeks. 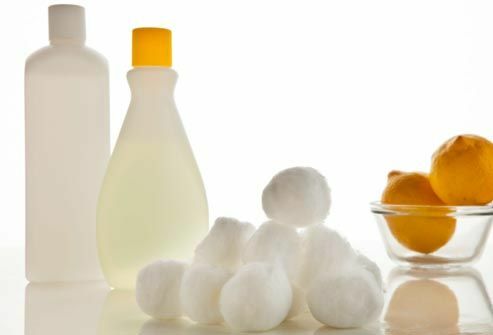 Use an acetone nail polish remover (or a nonacetone remover followed by lemon juice) to remove stains. When you polish, use a clear base coat first. But if your discolored nails are also thick, brittle, or curled, you may have a fungal infection. Skip the polish and head over to your doctor's office instead. No matter how embarrassed you are, don't shave your legs before a pedicure. Bacteria are more likely to get into your body through tiny nicks or cuts on freshly shaved legs. Certain kinds of bacteria live in tap water and can thrive in a dirty footbath. They can cause boils or other hard-to-treat infections, so wait until after your pedi to shave. You can take your own tools to a nail salon, even if you feel self-conscious. Germs can linger on salon tools that aren't cleaned, like emery boards. If you choose to use the salon's tools, they should be heat sterilized, soaked in clear antibacterial solution, or come prepackaged. Ask for a new tool if one falls on the floor during your appointment. You don't want to leave the salon with a skin or nail infection. In between pedicures, cut your toenails straight across to trim them. This helps prevent ingrown toenails and keeps them strong. Filing your nails slightly so they're rounded in the center is fine. Before you polish your nails, gently clean underneath them with a manicure stick. If you have diabetes, your health care provider will do regular foot exams and teach you how to care for your feet. Some salons let a certain kind of fish nibble the calluses off your feet rather than scrubbing them off. Some states have banned these "fish pedicures." Salon workers can't clean the tubs well in between customers while the fish are in them. And it's not possible to clean the fish, so they may spread infections from other customers. In cold weather, bring plastic wrap to your pedicure to help avoid smudges. Before you leave the salon, ask the technician to put a layer of cuticle oil on your newly polished toes. Then wind the plastic wrap around them before you put tights, socks, or shoes back on. Pedicure socks have openings for toes and can be worn with flip-flops. Or slip your feet into special pedicure boots that have a front flap that leaves your toes exposed. You might think bare toenails are ugly, but nails need to breathe and have moisture, and polish acts as a barrier. So skip the nail polish for a week or longer each month and enjoy the low-maintenance look. It's a good idea to remove your nail polish if you can't fix it as soon as it chips. Your toenails are vulnerable to damage in the spots where polish is missing. If by some miracle your polish lasts two weeks, go ahead and change it anyway. When you're pregnant and feel bloated, and even your ankles are swollen, a pedicure may sound heavenly. Good news! It's OK to pamper your feet. Pedicures are safe during pregnancy. Your nails don't absorb the chemicals in nail polish. If the odors from nail products make you feel ill, try sitting near a window or an open door. 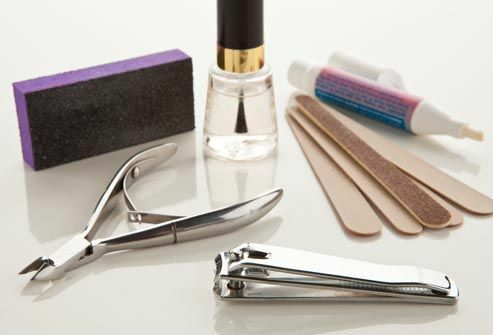 Whether you bring your own nail tools to the salon or use them at home, keep them clean. 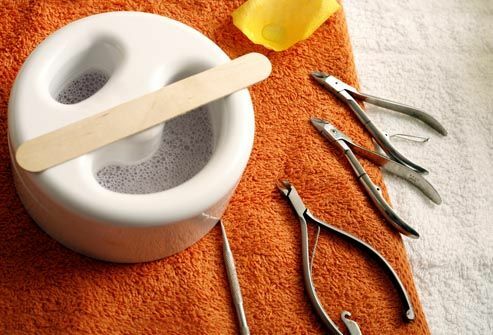 After each pedicure, give the tools a good scrub with soap and water. Then soak them in a disinfectant solution like rubbing alcohol for at least 10 minutes. There's no reason a guy can't have neat toenails. Some salons and barbershops offer special guy-friendly pedicures, with or without the nail polish. But everyday salons commonly cater to both sexes. Nail polish removers with acetone work well if your polish is very dark. They're also a good choice if you have a gel or shellac finish, which is hard to remove. Acetone can be drying and harsh, so if your nails or skin are sensitive, go for a nonacetone remover. It's gentler, but it'll take more work to remove the polish. Always check out a new nail salon beforehand, even if you're desperate for a pedicure. Be sure employees wash their hands and clean their equipment between clients. 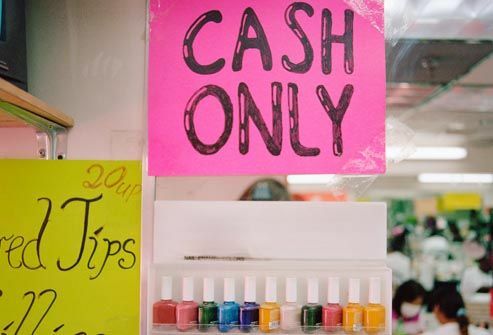 Most salons have an odor from nail products, but it shouldn't be overpowering. A very strong smell may mean that the ventilation system doesn't work. And look for the nail technician's state cosmetology license. It should be current and on display. American Academy of Dermatology: "Below-the-belt dermatological conditions," "Nails." American Academy of Family Physicians: "Nail Fungal Infections." American Podiatric Medical Association: "Dos and Don'ts for a Fabulous Pedicure." American Society for Dermatologic Surgery: "How to Avoid a Nail Infection." CBSNews.com: "Getting A Safe Manicure." CDC: "Fish Pedicures and Fish Spas." Medline Plus: "Diabetes Foot Care." Nails Magazine: "17 Ways to Knock the Socks Off Your Winter Pedicure Clients [Literally]," "How to Choose a Quality Nail Salon," "Foot Huggies Pedicure Socks." The New York Times: "Beauty Spots." Parents.com: "Pregnancy Pampering: What's Safe, What's Not." U.S. Department of Health and Human Services, Office on Women's Health: "Body changes and discomforts." Vugia DJ, et al. Emerging Infectious Diseases [serial on the Internet]. April 2005. WomansDay.com: "9 Things Your Nail Technician Wants to Tell You."